Stitches and Scissors: It has begun. I have bitten the big one. 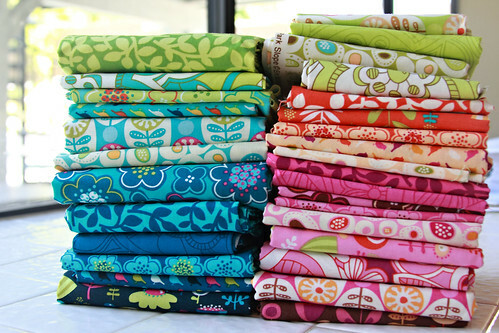 I have cut into my beloved Park Slope fabrics which is my favorite fabric line. It has taken me along time to decide what pattern to use. It put alot of pressure on me since I didn't want to get it wrong. But I think I have got it right since I am in love with it already. I am making a twin size and shooting for 85"x102" so that I have a good size overhang to cover the mattresses. I am so excited about this quilt. It has been awhile since I felt really inspired to make a quilt. My parents are coming to stay with us for a couple of months and so I should be able to get alot of sewing done. 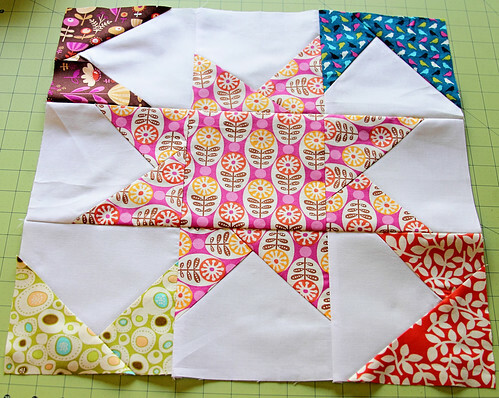 I have 4 large quilts in the works so lets hope I can get them done! It is driving me crazy that I have that many WIPs. I think you nailed it!! Love it! I love this collection too. The pattern is perfect. I can't wait to see it finished. it's going to be stunning!!! I like the way those stars overlap...haven't seen that before. I'm sure it will look great! This is going to be absolutely amazing! I can't wait to see it come together. It'll be fabulous and SO worth the effort! LOVE that pattern. Those fabrics will be perfect. I also love that your parents are coming for a couple of MONTHS ... jealous, but very happy for you. Love it! What size blocks are you using? Oh, very cool! I was struggling to work out how the corners fit in when I saw the first block, but it all made sense with a whole bunch of them together! Park Slope!! Love! Good job actually using it - it's a hard one for me to cut. One of the first fabric lines I ever bought, and still an all time favorite. Very VERY impressed that you have hung onto the park slope collection for so long. I have been using the tinyest bits for ages and have nothing left :( Also, great choice on quilt pattern! I'm so happy you cut into your Park Slope...they you can enjoy it every day in a beautiful quilt. I know how you feel about finding the perfect pattern - I hate to think about what I could have made, so I just don't make anything at all! Enjoy your time with your parents. Ooo you picked a really great pattern for your fabrics, good one!! It's looking awesome! What a great pattern for those prints! It's been worth the wait - they are gorgeous! Totally worth the cutting! It looks fabulous!! 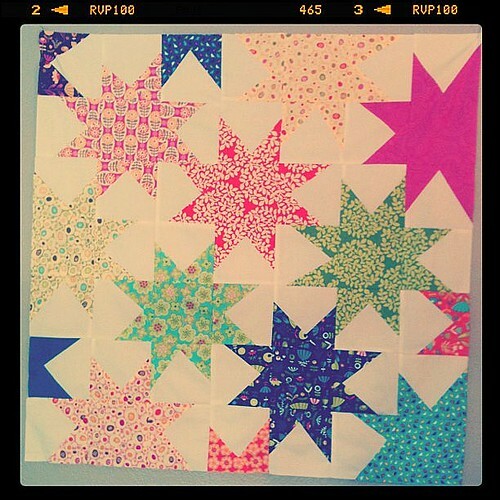 I just stumbled upon your blog, bloghopping along and just love the big prints and this star pattern! !On these dark evenings I love a bit cheerfullness! You have it. I enjoyed reading about you in my Sew to Swap book that arrived yesterday. Congrats.